"This recipe is what I've looked forward to on the holidays since I was a little girl. 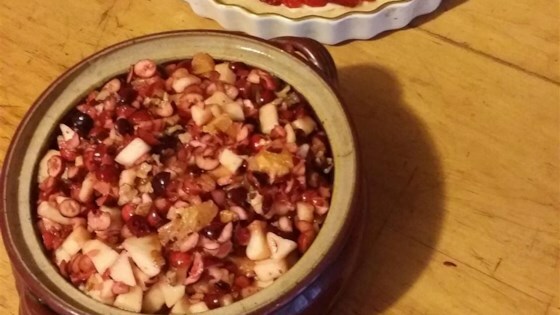 It is my Meamaw's recipe, and it is great for Christmas and Thanksgiving." In a food processor, combine the cranberries, oranges, carrot and pecans. Process until finely ground; add sugar and pineapple, mix well. In a mixing bowl, combine the gelatin and boiling water. Stir until gelatin is dissolved and add cold water. Mix together the fruit mixture and gelatin; pour into dish or mold and refrigerate until chilled. It felt like something was missing from this. THIS WAS AWESOME! ive used this recipe for like 2 yrs and everyone has loved it! This salad was wonderful! Not to sweet with lots of cranberry and orange flavor. I did omit the carrot, though. I made exactly per the recipe, except left the nuts out. Very good and a wonderful change from "Straight up" cranberry sauce. I will probably add another orange next time. I've used this recipe for more than 10 years and it's the best I've found! No need to add anything. You can feel good about the all the good things in it, and even the kids love this one!